Blessed Homemaking: What Are Essential Oils? Are you familiar with what essential oils actually are? Essential oils are the life blood of plants. The next time you drive by a field of fresh peppermint or hike through a pine forest, breathe deeply—you’re experiencing the soul-soothing power of essential oils. But essential oils are more than nice scents; these powerful plant extracts are your path to lifelong wellness. Primarily extracted through careful steam distillation, but also through cold pressing, the purest essential oils are far more powerful and effective than dry herbs, delivering quick and effective results. Any time you hold a bottle of powerful essential oils, you are holding the pure essence of health-promoting botanicals that can be diffused, inhaled, applied topically, incorporated into massage, or taken internally. Essential oils are the very smallest molecules of the plants. They are different than what we'd call "herbs". Essential oils are not easy to extract. In fact, it takes someone years to learn the art of distillation. 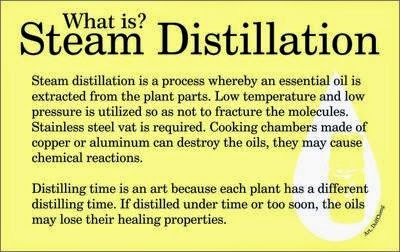 The distillation process is different for different plants. They should be taken to, and held at different temperatures, for different lengths of time to get the best quality oil. Every living thing has a frequency at which it operates. When something is dead, it has no frequencies. 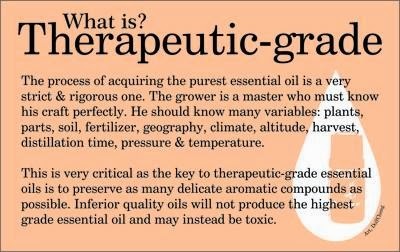 Essential oils have frequencies, which mean they are beneficial to our body because they may raise our frequency to normal when we are ill.
Are you familiar with the purity of essential oils? Purity of essential oils is huge deal. Because all plants produce differently based on the seeds, planting time, harvest time, weather, etc. you will have variables from year to year. But it's also important that plants are grown and harvested in correct locations to produce the purest oil. After growing plants for essential oils, then we have to harvest and distill them---another very complicated process. It takes many years to become good at this! For quality purposes, I only use Young Living essential oils. I have not mentioned them on my site before because I wanted to use them for awhile to see how they worked for our family. I have been very pleased, and we have been enjoying the benefits of Young Living essential oils for nearly three years now. YES. Brands do matter because of the purity aspect. The growth of the plant, the distillation, the soil it was grown in--literally hundreds of variables effect the final product. How can you tell if essential oils are pure? One way to tell is by the smell if it's been extended with alcohol or a rancid fatty oil. Putting the essential oil on paper is also a great way to check if it is not a blend which would have fatty oils in it. 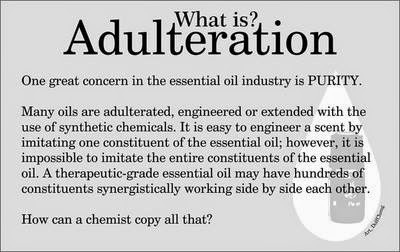 The pure oils will not leave any mark on the paper, while adulterated oils leave greasy marks on the paper.